This Volume contains a Complete System of Practical Cookery, so carefully adapted to the purposes of every-day life, that although a person totally unacquainted with the art here treated of may not be able at first to dress a dinner, merely by referring to this book, any Cook or House-keeper, possessed of ordinary experience, will certainly have the means of knowing, without further help than what these pages afford, how to prepare, in the best manner, every dish at present in general use. There are Twenty-five Chapters in all, arranged in the order of the following List, each of which is preceded by those useful Preparatory Remarks, which are usually kept at the beginning of the volume, at most inconvenient distance from the subject treated of. This is often embarrassing; and, it is believed, the novelty in arrangement here adopted, will be found advantageous to all parties concerned. A copious Index will be found at the end of the volume. Great pains have been taken to compose a work having, in all respects, a practical character. Care has also been used to collect valuable materials from various authentic sources, the chief object being the compositions of a treatise which might be called, with truth, the Cook’s Companion in the practice of Cookery; and at the same time, be no less useful to the mistress of a family, if required for occasional reference. The chief requisites, in a work of this kind, are – first, the intrinsic excellence of the precepts it contains; next, their economical adaptation to the habits and tastes of the majority of its readers; and, lastly, such a distinct arrangement of the various parts, that no difficulty can arise in searching for what is wanted, nor any ambiguity in the meaning of the directions when found. A perfectly original book of Cookery would neither meet with, nor deserve, much attention; because what is wanted in this matter, is not receipts for new dishes, but clear instructions how to make those already established in public favour. 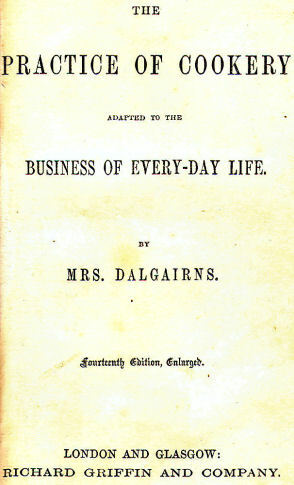 The study, therefore, of the author has been to consult the best authorities; compare different receipts with care and impartiality, and afterwards to select for publication those only which appeared economical, easy to follow, and calculated to furnish the dishes required for daily use, as well as those for occasions of ceremony. But nothing has been considered worthy of adoption, however high its pretensions, without some specific and substantial recommendations. Every receipt, therefore, has either been actually tried by the author, or by persons whose accuracy in the various manipulations could be safely relied upon. The defects usually complained of in most Cookery books are their extravagance, and their want of distinctness in the directions. In many cases, they are perversely adapted exclusively to the finances of persons who never think of reading receipts at all, but who overcome the whole difficulty by keeping highly educated, and, of course, expensive Cooks. Such works, therefore, afford little assistance to the young mistress of a family, to country servants, or even to persons who live in towns, but whose circumstances are so limited, that, with all the disposition in the world to learn the art of Cookery, they have no means of putting such costly lessons in practice. It is hoped that such criticisms will not apply to this work: as the author has used every effort of industry and patience, to arrive at the truth, and to impart it clearly and forcibly to others, so that correct knowledge and judicious economy might go hand in hand, in this important branch of housekeeping.